The 10 series has the look and feel of Cane Creek’s class leading 40 Series headsets with simpler machining and more economical materials. Designed with the upgrade path in mind, the 10-Series shares the internal geometry of Cane Creek’s higher-end headsets and, as a result, replacement and upgrade parts are readily available. Machined from 6061 T-6 aluminium. Sealed, lightweight polymer crown race. Stack - 4mm bottom, 8mm top (short), 15mm top (tall). Weight - 113g with 8mm top cap including stem cap, star fangled nut and M6 bolt. 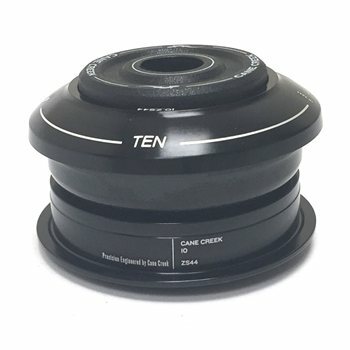 Cane Creek Compression Ring for 1 1/8 Inch Cane Creek Upper Headset Bearing.